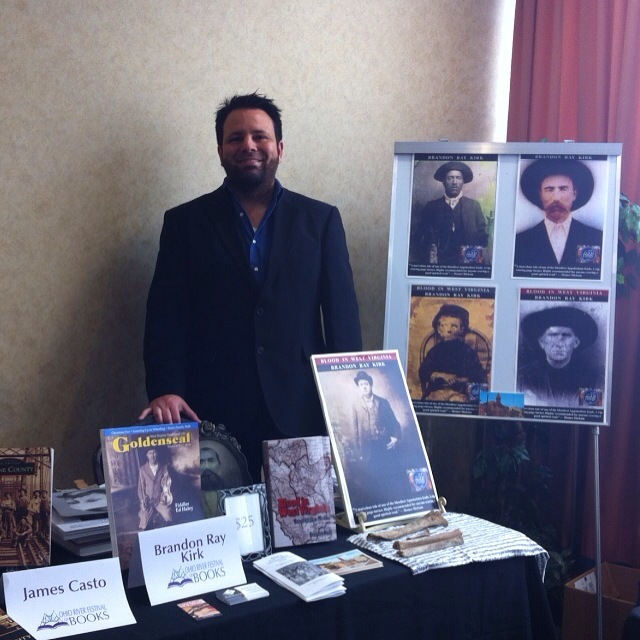 Here we are selling books and meeting folks at the Ohio River Festival of Books in Huntington, WV. We are located at Pullman Plaza Hotel (second floor) on Friday, September 30, from 5 p.m. until 9 p.m., and Saturday, October 1, from 10 a.m. until 5 p.m. If you’re local, come and see us! Chief Logan State Park, Logan, WV, 24 September 2016. Photo by Mom. Situated here among the “Hills of West Virginia” on the banks of the beautiful Guyan lies the little city of Logan–our home. Time was when a few years ago Logan was a struggling little village trying to pull herself out of the mud and how well she succeeded is left to you, gentle reader, to judge. We now have nicely paved streets, solid and substantial sidewalks, large and commodious business buildings and beautiful homes. Lots that were formerly occupied with frame buildings have been raised and have given way for substantial brick and stone buildings and more going up as fast as can be built with more to come in the future. Our people are liberal, energetic and hospitable and a glad hand and hearty welcome is extended to all newcomers, while the passing stranger is always welcome within our gates. Logan is situated in the very heart of the famous Guyan Valley coalfields and is surrounded with the natural advantages to become sometime in the near future a second Pittsburg. With branch roads leading in every direction, reaching a large number of mines from which pour forth every day an enormous of the famous “Black Diamond” which afford employment to a large army of laborers and positions for many more, with different kinds of business houses in the city requiring the services of a large number of skilled laborers we find our little city progressive in the fullest sense of the word and what Logan is at the present time will be nothing in comparison of the city in the near future. At the present time we boast of three wholesale houses, a great many department stores to supply your every want, and many handsome churches to look after your spiritual needs, a large number of efficient lawyers to look after your legal affairs, quite a few experienced physicians and surgeons to attend your physical ailments and a large, commodious high school building and a large public school building to look after the education of your children and while we admit that “all work and no play makes Jack a dull boy” we have for your amusement two elegant and comfortable moving picture theatres at which you view the best pictures obtainable while we extend you an invitation to visit our park where you will be entertained with athletic sports. We take time during the strenuous hustle and activity to eat occasionally and we invite you to patronize our large and first class hotels, restaurants and boarding houses where you will be furnished the best food the market affords. If you have any surplus change that is too heavy to carry around in your pocket we have, for your convenience, two large and perfectly safe banks who will gladly receive your deposit or extend any other accommodation consistent with good sound banking. Take a little time and sit down and rest while we furnish you with the Daily Courier and permit you to digest the very latest news fresh over the wires of the Associated Press. In fact call on us for any favor and we will do our utmost to supply your every need and should you unfortunately get in the way of any of our numerous “jitney buses” we will tenderly convey you to our new, fine hospital, just completed at a cost of $40,000 where your injuries will be treated while you wait. ‘Tis said that Holden and Omar are only suburbs while Craneco is clamoring for annexation. –What? Yes–why–sure climbing to the cupola of the Court house and enjoying the balmy breeze of pure mountain air, shaded from the rays of the noon-day sun I fell asleep and being espied by the janitor who being afraid my presence would molest the workings of the town clock has climbed up here and shaking me from my pleasant day-dream has invited me to plant my cute little “tootsies” on terra firma. Some dream. Believe me. Source: Logan (WV) Democrat, 22 June 1916. 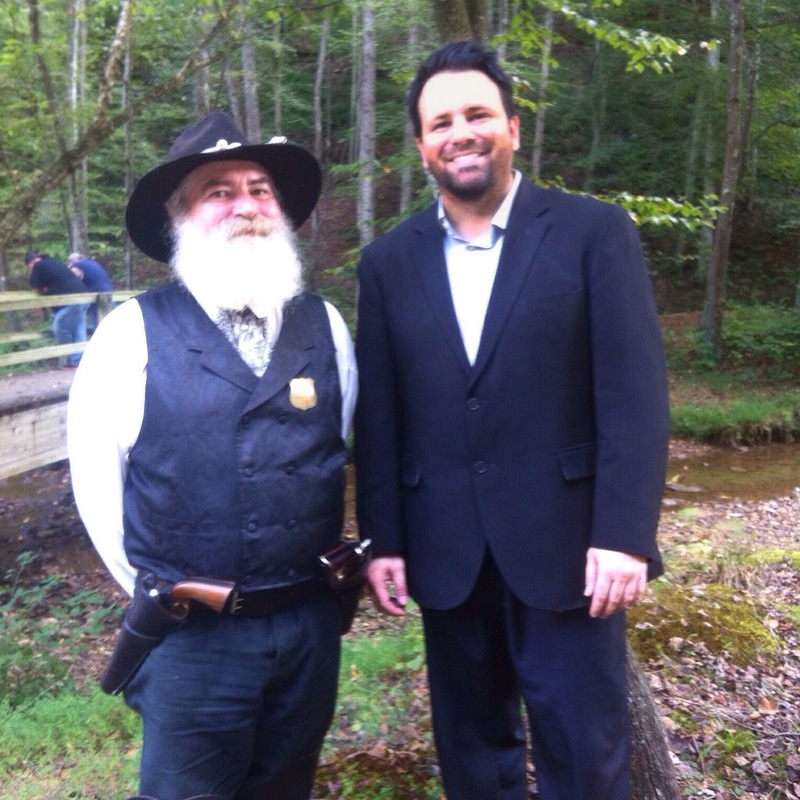 We had a great time promoting the book and meeting folks at Rebellion in the Hills in Chief Logan State Park on Saturday, September 24, 2016. Our next appearance will be this weekend at Ohio River Festival of Books in Huntington, WV. Between 1850 and 1863, the following men served as justices of the peace in the Harts Creek community, then a part of Logan County, Virginia. The primary source for this material is Deed Book D, which is located at the Logan County Clerk’s Office in Logan, WV. Material is arranged based on the grantor’s name as given in the deed, the grantee’s name as given in the deed, and the date of the deed. Some of the deeds are partially destroyed, obscuring dates. This list is a work in progress and will be updated periodically. Many thanks to the county clerks and their employees who have always been so helpful to my research these past twenty-five years. 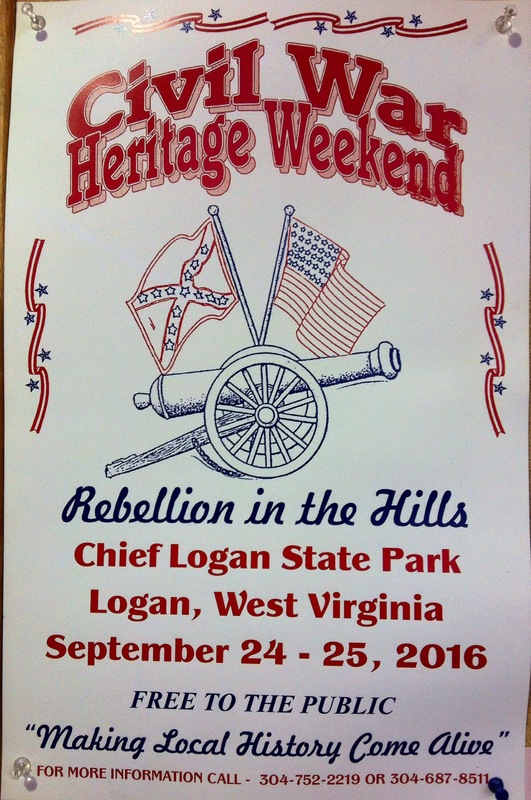 On Saturday, September 24, 2016, the book and I will appear at Rebellion in the Hills in Chief Logan State Park in Logan County, West Virginia. If you’re local, come and see us. About 1910, Rev. Thomas H. Perry reflected on his long life, most of which was spent in the vicinity of Tylers Creek in Cabell County, West Virginia. In this excerpt from his autobiography, Mr. Perry recalled his early days as a preacher in the Guyandotte Valley. After I had preached my first sermon, I then preached in the school houses in the most isolated places. I had two reasons for this: first, I thought I would meet with less intelligence; and second, that they heard so little preaching, but to my surprise the people would come for miles to my meetings, and I would wonder why they came. Do they come through evil curiosity, or do they come from a sense of duty? I would pray to the Lord, down deep in my heart and soul that He would help me at this hour to preach His word with such power that these people, who have come here this day through vain curiosity, that they may be made to feel the weight of their sins, but if they have come for the good of the soul that they may go away from this place feeling it was good to be at church to-day. The hardest struggles I had in my work was from the time I entered the church to the beginning of the sermon. The presence of strangers and noted people generally embarrassed me to some extent until after I had announced my subject and read my text. After that I did not notice them anymore than others. I never tried to change my voice from the natural or make it appear I was educated, but put my whole soul and heart in my subject with the hope that somebody might be saved to-day. About the time I began to preach there were three other young men who entered the ministry, J.D. Carter, John J. Perry and John A. Petit. These young men lived on Tyler’s creek. John J. Perry was the founder of Susannah church, one of the good churches of Grant district. He was killed by falling timber, near Salt Rock, in 1884. John A. Petit was the founder of Bulahann church in Union district. This church was named in honor of my mother, because of the interest my father and John J. Perry took in its organization. Bro. Petit was a fine preacher and had a great many friends. He was pastor of a good church in Ohio. He died, I believe, in 1885. Bro. Carter was the founder of Zoar church, another good church in Grant district. He was a large man of fine personal appearance. His ability as a preacher was second to none in this end of the state. He died in 1906. Knowing these three men as I did, I considered them the three greatest lights that ever went out from Enon church. About this time I was going to school at Salt Rock. A Mr. John J. Rowsey, a very noted teacher was our instructor that year. Some of the old men tried to discourage me by saying if God had called me to preach I did not have to go to school to learn how. But I felt the need of a better education and knew that some of my appointments did not pay me one dollar a year and I was hard pressed financially. These things would discourage me very much. I saw at once there was a race to be run and a battle to be fought in this life, and I remembered that the Bible said the race is not to the swift, nor the battle to the strong, but to them that put their trust in the Lord. I believed every word in the Bible was the word of God, I could not treat it with indifference. I was determined to preach all I could and go to school all I could, and raise my finance all I could, and as to those people that go to church with their guns and those that sit and smoke during preaching, I have a great love for them as well as others; for their souls are as precious in God’s sight as the souls of the rich and most refined. Source: From Youth to Old Age by T.H. Perry, Chapter 10, p. 25-27. Logan County Banner (Logan, WV), 13 April 1893. About 1910, Rev. Thomas H. Perry reflected on his long life, most of which was spent in the vicinity of Tylers Creek in Cabell County, West Virginia. In this excerpt from his autobiography, Mr. Perry recalled his participation in Civil War activity in eastern Kentucky and southwest Virginia. After the night fight, above Prestonsburg, we knew the Federals were above us and we would have to fight if we ever got back to Dixie. The cold weather and deep snow and timber across the road and Federals to contend with, we moved very slowly. One morning we stopped, as I thought for breakfast, and as I was almost frozen I rejoiced because I thought we will all get warm and some beef, as I saw one man shoot down a cow. But just at that time the Federals run in our pickets and began shooting at us, but I was so hungry I ran to the cow and cut two or three pounds out of the hind-quarter and took it with me. We ran about one mile and there we saw Colonel Hounshal’s regiment in battle line, who held the Federals off us until we could get our breakfast. I took my beef without salt and put it on the end of my ramrod and held it to the fire and cooked an ate it, and it was good. The next day my company was the rear guard and it was reported to the captain that the Federals had got between us and our command. The captain said: “Men, we will have to fight or we will be taken prisoners.” There was a preacher with us that day. He said: “Captain, I did not intend to fight, but rather than be a prisoner I will fight. Give me a gun.” When I saw him shoulder his gun, it did me good. I thought if a preacher could fight it was not bad for me to fight, as I was only a prospective preacher. One very cold night I was detailed on the outer picket post, the orderly said: “You can not have fire as they are likely to slip upon you and shoot you.” I said to the orderly: “I cannot stand it without fire.” I thought I would freeze to death. The orderly said: “I cannot excuse you.” Just at that time Louis Bledsoe said to the orderly he could stand more cold than Perry could and he would go in my place and I could go in his place some other time. Never did I forget the kindness Mr. Bledsoe showed me that night. When we were within fifteen miles of the Cumberland mountains, our army cattle, prisoners and all we had was on one creek; that creek led to the main road across the mountains into Dixie. On either side of this creek, the mountains were high and very rough and covered with snow. The Federals cut timber across the creek above us, and had a strong army below us, and held us here three days and would have captured us and all we had if General Floyd had not come with his artillery and drove the Federals away from the head of the creek, and let us out. The first night after we crossed the mountain into Dixie, E.H. Perry, one of my brothers came to my captain’s tent and said: “Captain, are my brothers all here?” He said: “Yes.” Then my brother exclaimed: “Thank the Lord for that.” Never will I forget the tone of my brother’s voice that night for he knew we had been gone for forty-one days, and it was by the hardest work that we landed back in Dixie. Once more after this we went into winter quarters near the King Salt works, and they sent me to a farm house to nurse three sick soldiers. We had a large nice room, well furnished and the landlord was rich and good to us. He and his good wife would help me in waiting on the sick; he furnished us with everything we could ask for to eat. We stayed there more than three months. I saw in the beginning that I would not have much to do, and as I had the money and there was a book store at that place, I bought a complete set of school books and studied them hard that winter and it did me good. It helped me to keep down the roughness of a soldier’s life, and also to educate. Along the back yard there was a row of one-story brick buildings in which the negroes lived. Some nights I would go and hear them tell ghost stories, and they knew how to tell them for they had seen a great many ghosts. I deny superstition, but I noticed when these negroes had told me some of the most fearful ghost stories, if it was a very dark night I would ask some of them to go apart of the way home with me. Mr. James Stephens, one of my patients, died; the other two got well. We left that place about the first of May. I saw then that the south could not gain her independence, and I told these negroes I thought they would soon be free and advised them to learn to read and write. I talked with a good many old men in the south about the war. They said they should have raised the “Old Flag” and contended for the constitution, and as for slavery, they said it was dying out in the south anyway. Source: From Youth to Old Age by T.H. Perry, Chapter 8, p. 20-22. Logan County Banner (Logan, WV), 28 March 1889.